A team of U.S. researchers left on Friday to set up a laboratory at the base of Mount Everest to study the effects of high altitude on humans, which mimic symptoms associated with heart disease, obesity, sleep apnea and aging. 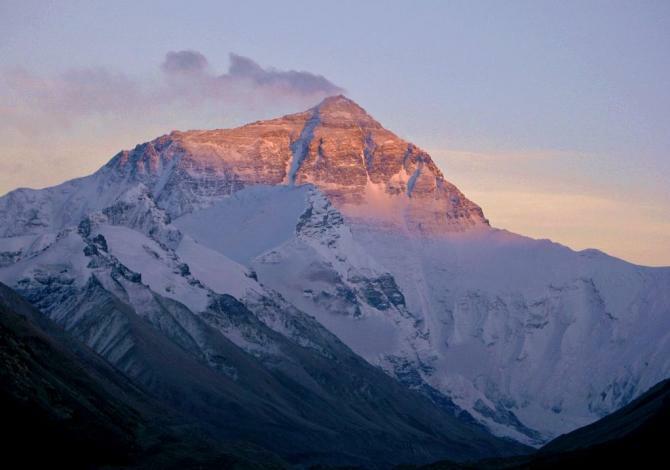 A group of scientists from the Mayo Clinic in Minnesota says that they plan on monitoring nine climbers of the Everest expedition, sponsored by National Geographic, The North Face, and Montana State University from base camp, the clinic said in a press release. "We're studying the effects of extreme altitude on healthy, active individuals as well as these extreme athletes because what they experience mimics aspects of heart disease," lead researcher Dr. Bruce Johnson said in the statement. Johnson told The Minneapolis Star Tribune that his team will assemble a remote laboratory that will enable them to observe the effects of altitude on healthy bodies, and to help scientists understand conditions like pulmonary edema, which affects both mountain climbers and heart patients. All nine climbers will be fitted with equipment like a special watch and an arm band that will enable their bodies to be monitored at base camp. The watch measures the climbers’ blood oxygen level and the arm band will monitor energy expenditure and calories burnt. Climbers will also wear the “Mayo platform,” an instrument that fits in the pocket of the climber’s clothing that will measure their cardiovascular activity. Climbers’ cognitive performance, like their ability to think at high altitude where oxygen levels are low, will also be tested by specially developed video games. Previous medical research has also been carried out on Mount Everest climbers, and Johnson told Reuters that his team was just adding “some incremental bits of knowledge” to the how the human body works in extreme conditions. "The study is also very closely associated with the work we do back home with heart patients and patients with lung diseases," Johnson told Reuters. More than 300 foreign climbers and 400 Sherpa guides have gathered at the base camp at about 17,390 feet to climb the world’s highest peak at 29,035 feet during the current climbing season which started in March. Scientists will be blogging from base camp for people at home to follow their research.